Dallas Fort Worth real estate news, local home price trends, statistics, and profitable insights written by Chandler Crouch Realtors. We're working hard to get things ready so that when we help with your property tax protest, everything runs smoothly without any trouble. The appraisal district needed to get further approval fro some technology we're using to help make the process streamlined for you. It shouldn't be too much longer, but we have until May 15th to turn everything in, so we're still in great shape. Chandler and the team recorded a video just to provide an update (see below). Also, Chandler will be speaking to several home owner's associations, community groups, possibly a chamber of commerce or two, and other types of groups to teach homeowners how to protest and provide some tips etc. If you know of any groups that might appreciate hearing from us on that, please let me know asap. Our calendar for speaking engagements is filling up pretty quick. In the meantime, if you have any other real estate related questions, please don't hesitate to reach out. We're here to help any way we can. I put together a short video with our team that covers some current issues. Don't have 10 minutes? Jump to the section that interests you most or scroll below the video to see abbreviated notes. Real estate prices are down, which was expected. December was a record month and we expect to see significant price gains in February. Pricing is a result of the relationship between supply and demand so in the video I show you exactly where demand and supply levels are at and discuss what this means for you. Amazon recently announced that they are moving their headquarters. Dallas Fort Worth is one of 20 areas under consideration. This would bring 50,000 new jobs over a 10 year period of time. Watch the video to learn which key factors play a role in their decision process. Recent changes in the Texas Real Estate Commission (TREC) contract could cost you thousands if you don't know about them and take action now, well ahead of your plans to sell your home. Now all repairs must be completed by a licensed professional. This means after you get under contract, you can't fix anything in the house without calling a licensed professional. What may have cost you just $5 to do on your own will now cost as much as $75 when considering that most professionals will charge you a trip fee just to show up. The main tax protest deadline this year is going to be May 15 instead of May 31. There is no need to act on this information now. They plan to send value notices out around April 1st. As soon as they do, we'll be on top of it to help. We are making preparations to help a record number of people. If you know someone that would reliably show up on time, do great work, treat it like a high paying job, but would be interested in volunteering to help, please send them my way. This video is different than any other we have ever released. I have been reflecting on 2017 and thinking about what 2018 will bring. I had a little fun with it and just thought I would share my thoughts. You'll hear what I got for Christmas, how to make a successful New Year's resolution, a thank you message for 2017, and your real estate market report for Tarrant County Texas as well as a hint on what the real estate market is expected to do in 2018. Enjoy! 0:16 What I got for Christmas - "My Pillow" and the answer revealed... Is it the most comfortable pillow I've ever owned. 5:14 What happened in 2017 - I must say Thank You! Taxes are due by Jan 31 whether you received your bill or not. Call your mortgage company and see if they received your bill. If your taxes are higher than you were expecting, it's likely because the appraisal district proposed a value significantly higher than last year. We may have protested to lower the value from what they proposed, but your taxes may still have gone up if the amount we reduced it to is still more than last year's tax value. If your monthly payment went up, you likely have an escrow shortage. The mortgage company's default payment plan is 12 months. Call and ask if you can pay it out over a 2-3 year period of time. This is usually an easy 15-minute phone conversation. Prepare for your protest for next year. Take photos of issues. Get quotes. Save quotes / unpaid invoices to use as evidence in your protest. File them away to save them for your protest next May. We can help you eliminate your entire tax bill for good... By helping you sell your house. If you can't afford to live there, we want you to call us. Our goal will be to help you find a way to stay in your house, but if you have no other option and you've determined that you must move, we will help in 2 ways. We will help you determine how much you can expect to sell it for. Often times it's more than you think. We will review 14 options that our team put together for you. Is it a bad idea to sell in fall and winter? How does the market look? Kelley Watkins is a terrific writer and kind soul. I am flattered by this and humbled by such an incredible team that has done so much to help so many people. If I didn't work with the best people on earth this recognition wouldn't be possible. If you have a minute click here to check out the article she wrote featuring us as New Homes Directory Realtor of the Month. There's a certain point in the lifecycle of renting where you say to yourself: I just can't do this anymore. Maybe it's the upstairs neighbors, who relentlessly stomp across their apartment into the wee hours of the morning. Maybe it's the numbingly dull white walls you've stared at year after year. Or perhaps it's that bitter pill of knowledge that your hard-earned money is circling down the drain—en route to paying someone else's mortgage. But just because you want to buy a home doesn't mean you should buy a home. Even if you've already evaluated your finances and told yourself, "I can swing a down payment," there are some additional key questions to ask to determine whether you're ready. Here, we unveil some oft-overlooked, soul-searching inquiries that you really should ask yourself before you make the biggest financial commitment of your life. Ready? “The most challenging time in someone's life to buy a home is during a time of loss—and that can be many kinds of loss,” says Tyler Whitman, real estate agent with TripleMint in New York. “If it's truly a high-stress moment, adding a move on top of that only makes things worse." Even if you think you're in a good place, emotionally speaking, Whitman warns that stress might cause you to subconsciously make your housing decisions out of fear. It's better to wait until you’re past a situation and can know you’re making the best choice for you. “It honestly isn't a good idea to buy a house unless you plan on staying there for at least five years,” Crouch says. If you sell earlier, you may end up taking a loss on the deal. Here's the good news: Mortgage requirements have been loosening since the credit crunch, and you may very well be able to buy with less than 20% down. But the bad news is that won’t be the end of your upfront costs. Hire a mortgage broker and you could pay a 1% to 2% fee on the amount of the loan. A home inspection will cost you a few hundred. Your closing costs could add up to 7% of the total cost of the home. And then there’s the Murphy’s Law of it all: If something can go wrong, it probably will. “If the air conditioner breaks a month after you close, or the dishwasher gives out, that's now up to you,” Whitman says. One of the biggest benefits of homeownership, of course, is the equity. Instead of handing all your hard-earned cash over to a landlord, you're putting it back into your home—which you (hopefully) will sell for a profit down the line. But that equity doesn't happen immediately. In fact, for many buyers, it takes time. Sometimes a long time. Unless you pay for your house in cash, you'll be on the hook for not only your monthly mortgage payment but the interest on the loan as well. Stretching out your payments over more years—as with a 30-year fixed-rate mortgage—can help reduce (and stabilize) your interest charges. But it can be hard to pay down your principal when you're constantly trying to cover other costs. It's part of being a homeowner, and you need to decide if you’re good with it. So do the math. Understand that when you're buying, you'll be taking on a big down payment and all those additional costs. On the other hand, you'll want to take a look at your local rental market. If your rents are increasing steadily year over year, you might be shelling out more on temporary housing then you would on your own home each month. And you may find yourself with your savings too depleted to buy. That could mean that buying, while a punch to the wallet now, will be more affordable in the long run. But if you live in a more stable rental market, it could be better to sock away some cash and wait a few more years to purchase a home. You can use our handy Rent vs. Buy Calculator to crunch the numbers and decide what's right for you. Your co-workers don’t understand why you’re still renting. Your friends are all buying their first homes. You've been saving for years specifically so you can buy a house and become a key-carrying member of the Great American Dream. It may seem like you should just buy already, but try asking yourself: Do you really, truly want to? After all, buying a home is arguably the biggest financial (and, sometimes, emotional) commitment you'll ever make. You need to be sure it's right for you—no matter what anybody else says. The study concludes that successful "For Sale By Owner" (FSBO) sellers achieve prices significantly below those from similar properties sold by a Realtor. The study does not take into account sales that were first attempted as FSBO then switched to a Realtor due to an unsuccessful FSBO attempt. Something that doesn't appear to be taken into consideration by the study is the extra benefit of having someone deal with contracts, negotiate, and field dozens of interactions with inspectors, title company, lender, and the opposing party to the transaction. It's important to acknowledge that not every agent provides a service as valuable as what they charge, however, they do on average. This means that if you do your homework and hire an above average agent, you are likely to get a better than average return on your money hiring a Realtor. Several cities were studied. The conclusions were the same in every location. 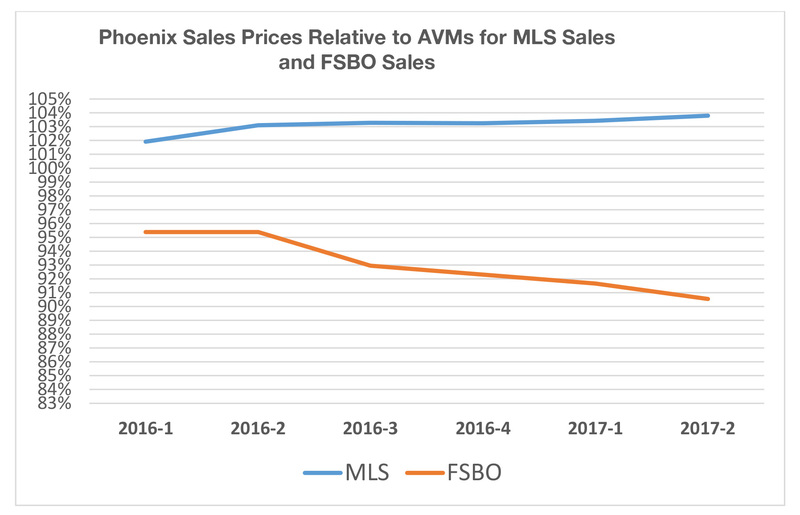 See below for the graph showing the findings of the Pheonix area study.